Established in 1938, China Tuhsu Yunnan Tea Import & Export Corporation as one of the leading manufacturers and exporters of Chinese tea, greatly promoted the development of Pu-erh tea. "Ji Xing" (LUCKY) was brand registered in 1978. This loose leaf Pu-erh tea box is one of the chief exports of the Corporation. 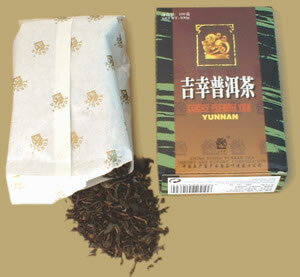 We are delighted we can make this 1996 Pu-erh available to you here. Limited quantity! An opportunity to enjoy nice aged loose leaf Pu-erh and don't have to break the cake or the brick. PREPARATION: To prepare loose leaf Pu-erh, place approximately 2 tsp. of leaf per serving in a teapot. Rinse by covering with boiling water and quickly pour off. Fill with boiling water again and let steep 5-30 seconds (depending on how light or dark you want the tea) and serve. Pu-erh tea may be steeped 10-20 times.